Now this...this is how you make a dramatic video game trailer. Pretty glorious, right? For those of you that are confused: this is the launch trailer for Goat Simulator, a game in which you can cause all sorts of chaos as a goat. Like say, blowing stuff up or ruining/enhancing a human's party with an axe. Thing is, the launch trailer f0r the game is making fun of the famous Dead Island trailer from 2011—a trailer which, while not really indicative of the actual game, was so gripping that it's widely regarded as one of the best video game trailers in recent memory. 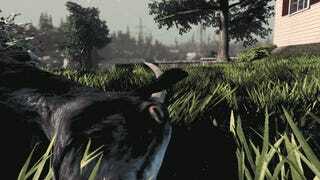 Goat Simulator launches on Steam on April 1st. No, that's not a joke.